I would LOVE to get shot of the forsythia in my front garden. And the first great big laburnum too. A conspiracy in yellow, those two. Beautiful roses,am looking forward to mine this year. A couple are out but most not yet. No! Afraid not. Dead as dodos. I’m half wondering if I put them in upside down, it wasn’t easy to tell which way up they should have gone. I love it when you post about roses. But then again so many temptations! Champion of the world is aptly named. Can i find a space??? Beautiful roses: I like Champion of the World. And iceberg is a favourite of mine as it flowers for such a long time. Mine are still flowering over here on the other side of the world! I never knew that about poppy seeds laying dormant in the soil until it’s exposed – that means the seeds I scattered in part of my allotment last year might not have gone to waste (they never germinated)…. maybe I should clear some more of the grass & weeds away in the hope the poppies will grow next year! Oh that wee Alpine is nice Tom. It’s a brilliant colour of yellow. The modestly named Champion of the World, could well be, it is a stunner! Love the others too, with scent too …… gorgeous! What a lovely June post! Great to see the flowers you grow. I have 3 iceberg cuttings which I brought with me when I moved house as my original one was too large to move. It has taken two years but now they are really taking off and very healthy. I love the other roses you pictured. Thank you and happy gardening! Champion of the World, eh???? Damned faulty innoculation. Oh well, it’s on the list for next year (you’ve already filled this year’s list, thanks). It’s odd; poppies are a plant that normally I have difficulty with, But so far this year, a Welsh one has taken up residence and I have a couple of large ones in the borders – I planted them last year but thought they’d died because they just went brown and keeled over. Didn’t get round to digging them up and this year they’ve decided to come alive again. Beautiful roses. I am hoping mine will start by next week. Some are nearly open! So much to like here! The scalloped edges of your vibrant (to say the least!) Amanade appeal to me greatly. I dunno. Those roses look a wee bit too English. So, they could get eaten by snails, or they just might eat the snails first. Oh, poppy envy! Beautiful selection of roses too. I love June! Re your forsythia, my two kerrias, one single and one double, have got a disease and the web tells me to dig them up and burn everything!!! So I will lose my lovely yellow early spring – except – Hurrah for forsythia!!!!! 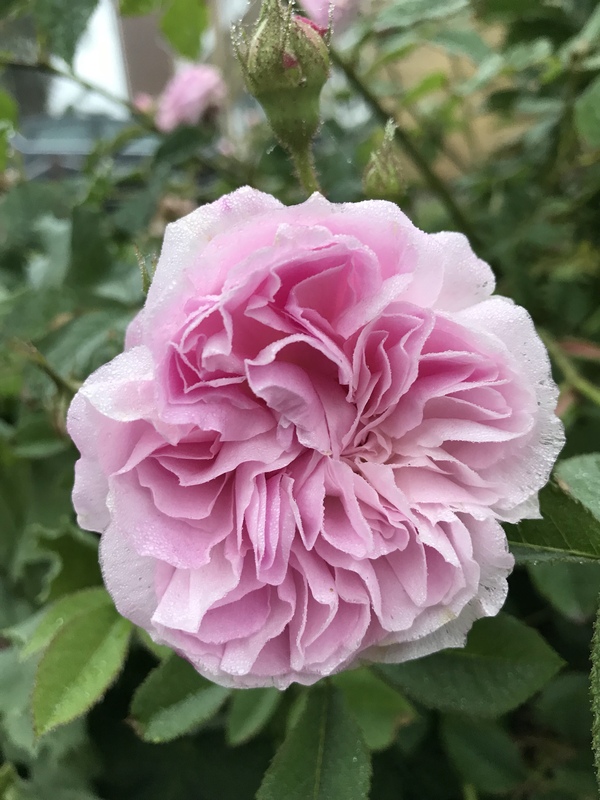 I left the Iceberg rose in the front garden when I moved, but I had resurrected it from the front garden jungle 17 years ago, so thought it should stay put. Champion is certainly worthy of its name.